Most of the pictures that I have published are of rooftop wind system installation done recently. Some are featured in newspaper articles and so forth. But the videos are the best thing to see as they really show you what it's like to have a home wind turbine installed and running. 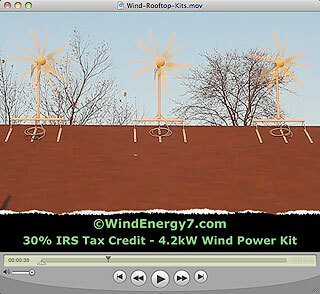 Our Wind/Solar Hybrid systems are qualified for government tax crdedits of 30%. So, for your investment made in these systems the government tax incentives are 30% within one year that you get back from the IRS. So, basically the government will pay for almost 1/3 of your investment made in your new home energy system. Of course that's not all, as soon as your system is up, you have improved your home value by atleast an equal amount of the investment. Your green energy home is more likely to sell than others with no home generation or emergency power system. Think about it. Look at homes for sale.. Can any of them generate their own free electricity, how many can compete with such a solid green energy capability like your home has. It's an attention getter and will bring people to see what it's about if you ever need to sell, your home has a dramatic edge. In addition to your home's improved value, 30% government incentive, you will get free reliable electricity every day. The systems are designed for reliable power output for the next 30 years or so. With every increase of the utility company power your investment gets better all the time. Utility costs are rising all over and will accelerate over the next few years. First options in choosing your kit are, wind only, or wind AND solar. You'll notice that in the name description and the model numbers wind/solar, or WS, means kit has solar panels in kit. Having a hybrid wind AND solar system is really going to make it a more consistant green energy system. If you're on a budget, get the wind and you can always add solar later, we will always help you upgrade these systems, it's all based on low price point to get into home power. 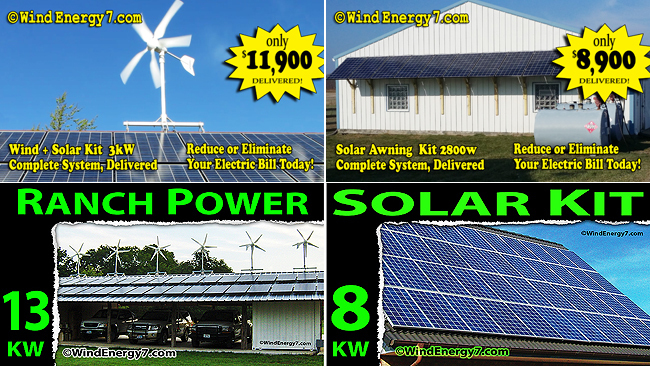 We can't all afford a giant windmill or solar system, these are affordable. Below is a graph showing the weather cycles of wind/solar and why wind/solar hybrid is so much better than solar only, or wind only systems. Here's a link of some pre-sale questions that you may find helpful . We have Yard Signs, Car door Magnets, Business Cards, T-Shirts, Baseball Hats, Postcards, and Brochures, soon to be avail. for dealers to order from the site. I'm available by phone to talk about the systems if you need pre-sale consult. Call if you want to talk. We have several different options starting at $2990 and going up from there. Each linked system has a list of what's in it if you click into the pages. Here's list of systems and links to purchase. There's so many folks have been considering and thinking over a system, so I just wanted to give fair chance. Many calls are starting to catch me on phone with others. If you call and want a system, I will get back to you and talk about what you need and what we can do. Please fill out our Contact Form at the website, our system will automatically send you information and provide our contact info. Last edited by Rooftop Wind Turbine on Wed Oct 06, 2010 10:46 am, edited 6 times in total. Anyone wanting a small wind turbine, fill out the contact form and I can connect you with the dealer for your area. There are still areas open for new dealers but county territories and entire states are being established now, a few states completely established. So, if you are interested in becoming a dealer fill out the same form and we can see if your area may still be open.